There’s something about the coziness of pubs—and let’s face it, the inspiration that comes from alcohol—that makes these establishments into homes away from home for various eventually successful writers. 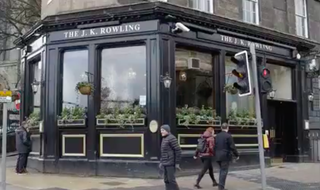 Sherlock Holmes scribe Sir Arthur Conan Doyle, for example, shared his most famous creation’s love of the drink, so the fact that a legendary Edinburgh pub boasts the author’s name is not much of a surprise. But now the The Conan Doyle on York Place is about to get a month-long facelift in honor of another Scottish writer: J.K. Rowling. While some locals are protesting the change, they only need to hang in there until January 25, when The Conan Doyle will get its original name back. No word on whether The J.K. Rowling will feature butter beer or any other Leaky Cauldron delights in the meantime.